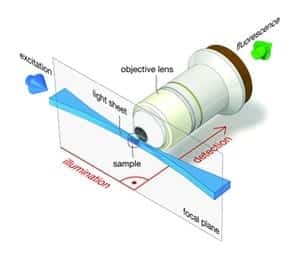 The basic principle of light sheet microscopy – also known as selective plane illumination microscopy (SPIM) – is to illuminate the sample from the side in the focal plane of the detection objective (Fig. 1). The illumination and the detection path are distinct and perpendicular to each other. The sample is placed at the intersection of the illumination and the detection axes. The light sheet excites the sample in a thin volume around the focal plane and the emitted fluorescence is collected by the detection optics. The earliest instrument to employ the principle of light-sheet microscopy was the work of Siedentopf (Siedentopf and Zsigmondy, 1903), who used a light-sheet to observe gold particles in glasses. However, only in 1993, fluorescently labeled macroscopic biological samples were illuminated with light-sheets to achieve optical sectioning: orthogonal-plane fluorescence optical sectioning (OPFOS) (Voie, 1993) was primarily developed to image the internal architecture of the cochlea (Voie, 2002). In parallel, the confocal theta microscope was developed to improve the axial resolution of confocal microscopes (Lindek, 1994). It was not until the publication of the SPIM paper in 2004 (Huisken, 2004) that development and use of light sheet microscopy took off. This article demonstrated the superior performance of SPIM and multi-view imaging in millimeter sized embryos of medaka and Drosophila melanogaster. Of crucial importance for the performance of the SPIM technology are the properties of the light sheet: thickness, uniformity, and its ability to penetrate scattering tissue. A light sheet can be produced in multiple ways. In SPIM, a laser beam is focused in one dimension with a cylindrical lens to generate a static light sheet. 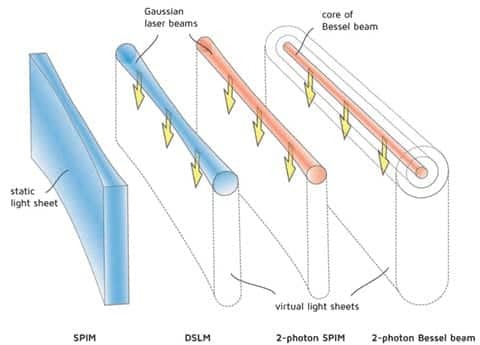 In DSLM (Keller, 2006), a virtual light sheet emerges by rapid scanning of a Gaussian laser beam. This way, much higher local intensities are generated, sufficient for two-photon excitation with infrared beams (2p-SPIM, Troung, 2010). However, SPIM, DSLM and 2P-SPIM still suffer from uneven light sheet thickness. Bessel beams have a thin and long core surrounded by a ring system, which when scanned produces a uniform light sheet (Fahrbach, 2010). Using two-photon Bessel beams, excitation will only occur in the central core of the beam where the intensity is highest. The resulting light sheet is thin and more uniform as has been demonstrated for the imaging of single cells (Planchon, 2011). Over recent years, light sheet microscopy has seen several improvements on both the hardware and the software side to produce better images in shorter time. To counter light scattering in thick samples, nowadays two light sheets produced by two opposing objectives are used to illuminate the sample from both sides alternately. Additional pivoting of the light sheet avoids shadows in dense tissues (mSPIM, Huisken, 2007). In SPIM the sample is usually mounted on a rotational motor for the observation of the sample from any angle. Such multiview images of the same sample can be fused using computational processing methods (Preibisch, 2010). To minimize rotation and registration efforts and maximize speed 4-lens systems, which use two detection and two illumination objectives, were introduced recently (SiMView, Tomer, 2012; MuVi-SPIM, Krzic, 2012; Weber, 2012).